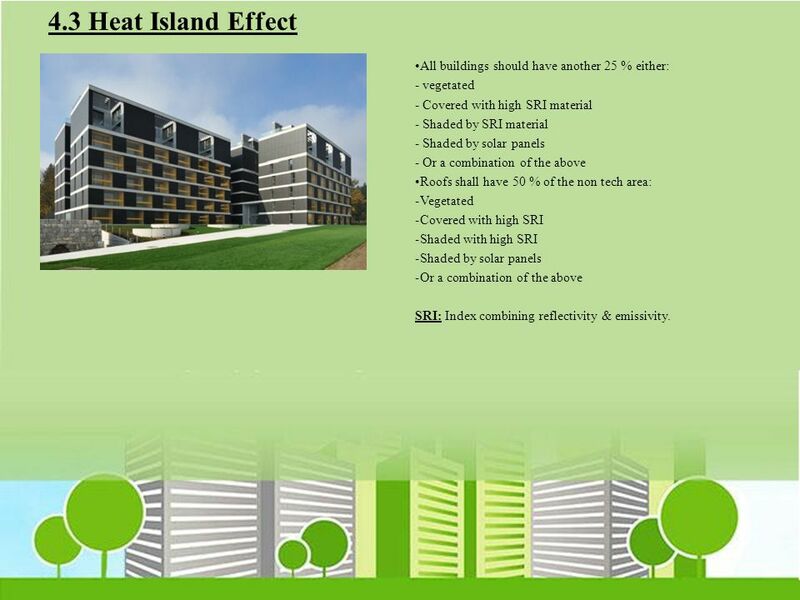 High frequency electronic ballast for fluorescent & Metal Halides conforming to IEC 60598 Common lobbies Parking Circulation Stairs Keeping a max of 25 % of the normal lighting Control System Heat Recovery Independent temperature control for A/C per zone. Hotel room management Thermostatic valve for radiators Outside compensation recommended 100 % FA AHU’s with heat recovery system. Heat recovery on generators for hotels, hospitals, industrial facilities of certain areas. 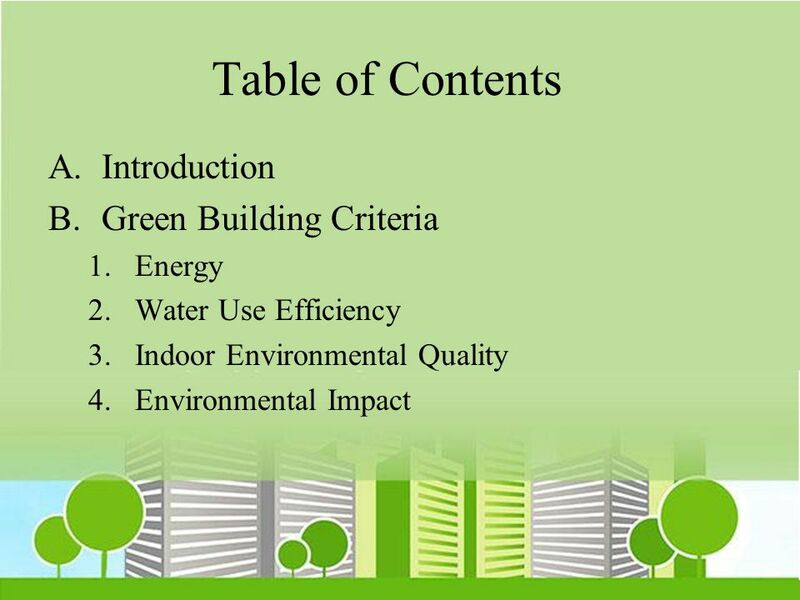 As per Ashrae Standards for ducts & pipes Electric metering for building with multiple Tenant. 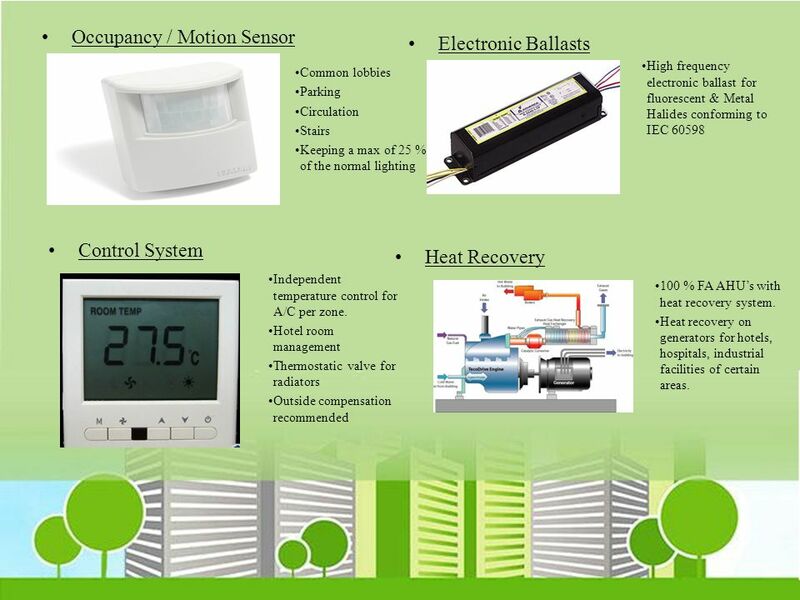 Energy meters for building supplied with central chilled water or heating system. 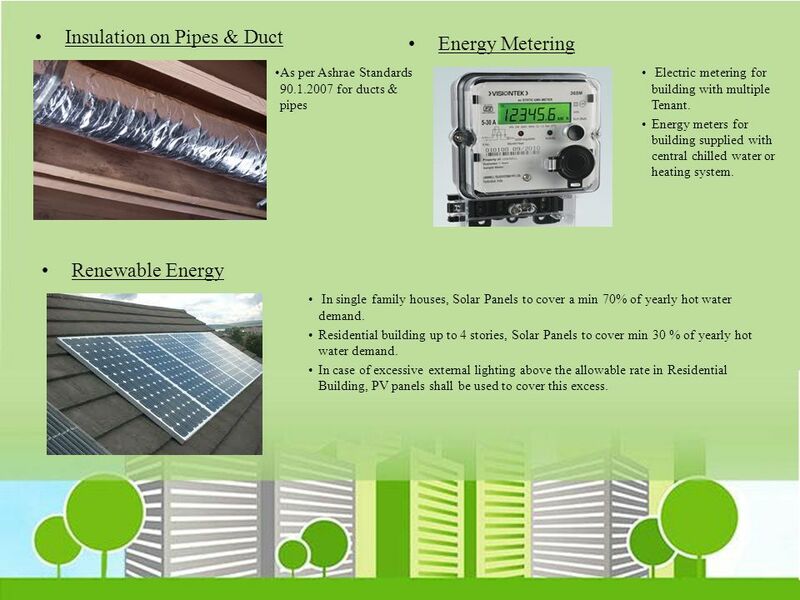 Renewable Energy In single family houses, Solar Panels to cover a min 70% of yearly hot water demand. 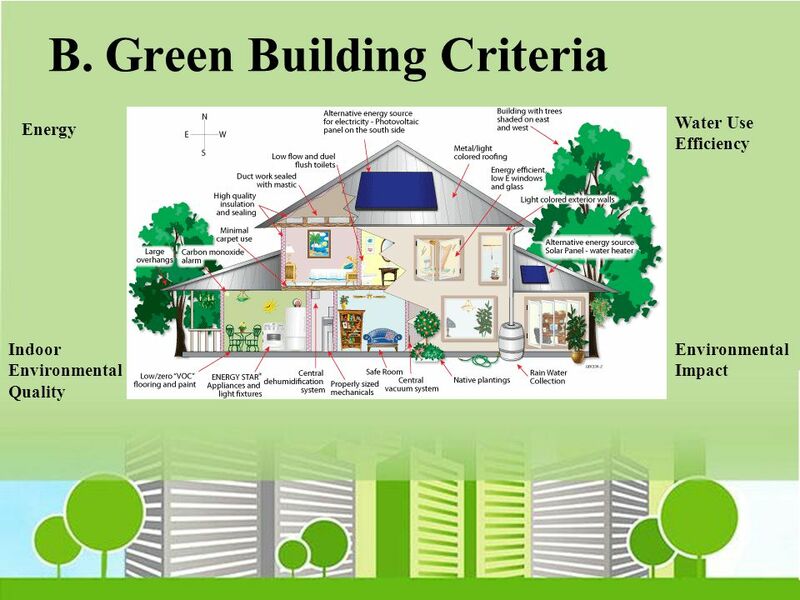 Residential building up to 4 stories, Solar Panels to cover min 30 % of yearly hot water demand. 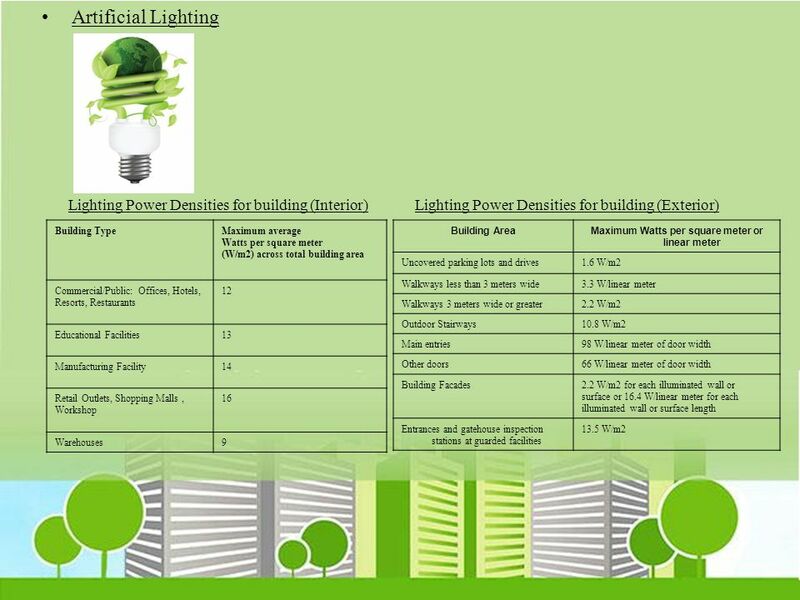 In case of excessive external lighting above the allowable rate in Residential Building, PV panels shall be used to cover this excess. 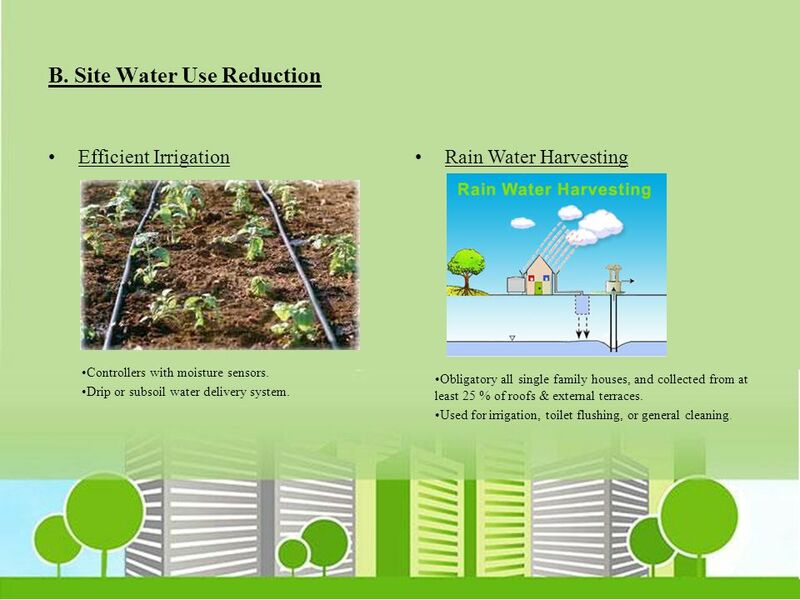 Efficient Irrigation Rain Water Harvesting Controllers with moisture sensors. Drip or subsoil water delivery system. Obligatory all single family houses, and collected from at least 25 % of roofs & external terraces. Used for irrigation, toilet flushing, or general cleaning. 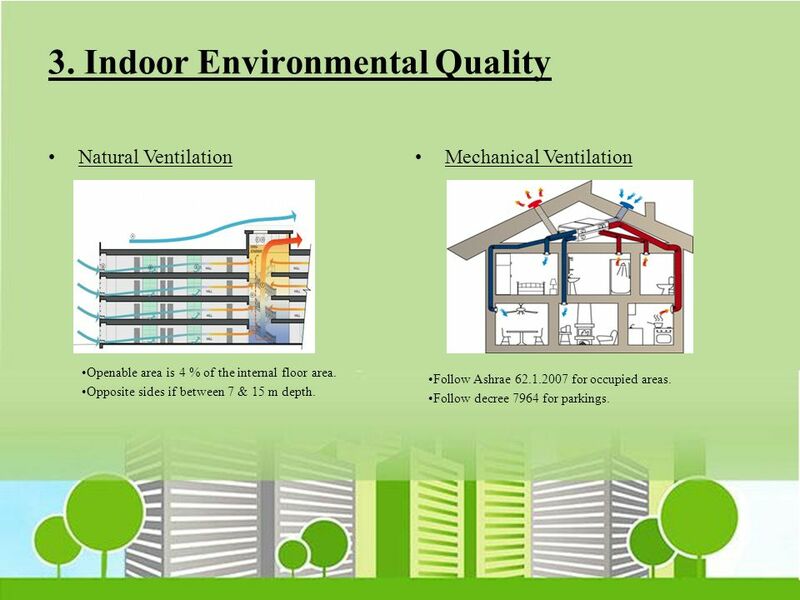 Natural Ventilation Mechanical Ventilation Openable area is 4 % of the internal floor area. Opposite sides if between 7 & 15 m depth. 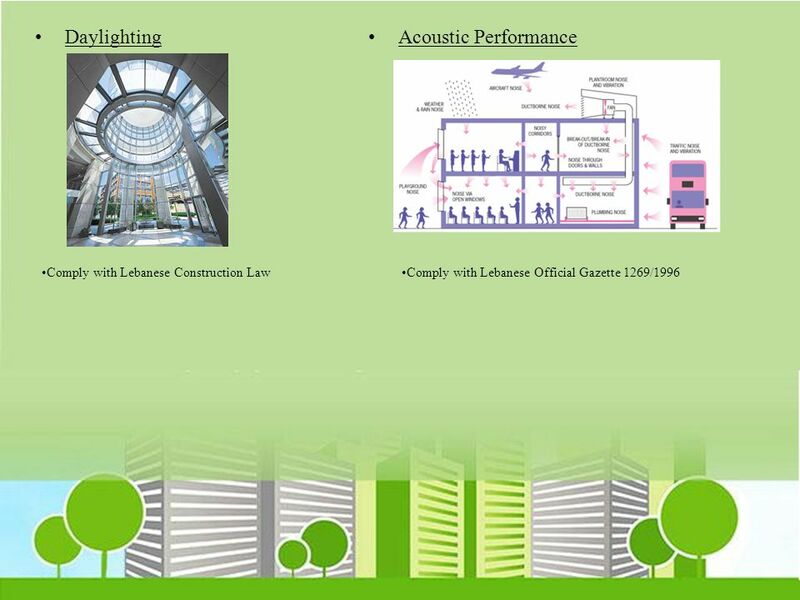 Follow Ashrae for occupied areas. Follow decree 7964 for parkings. 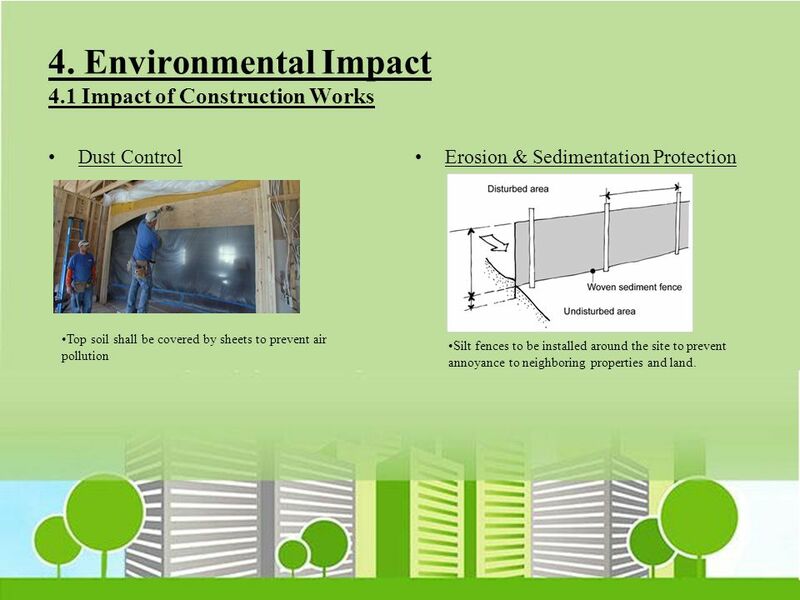 Dust Control Erosion & Sedimentation Protection Top soil shall be covered by sheets to prevent air pollution Silt fences to be installed around the site to prevent annoyance to neighboring properties and land. 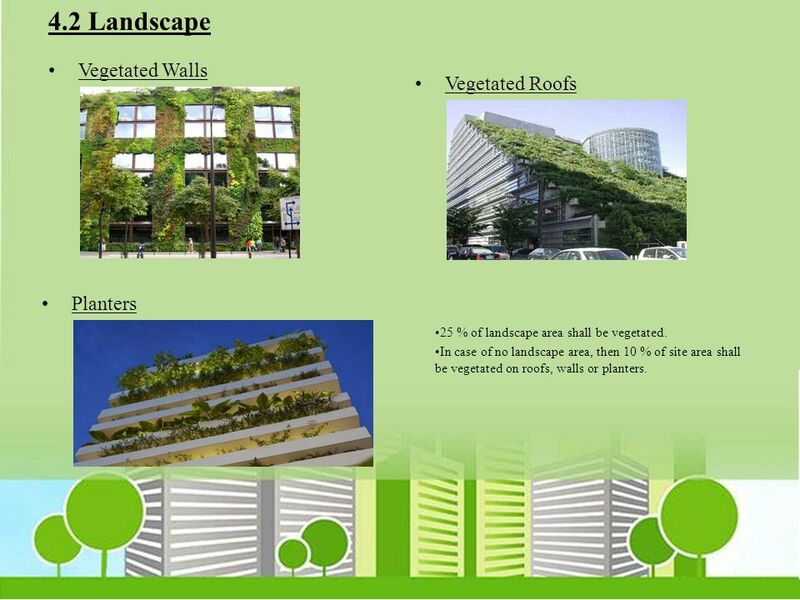 25 % of landscape area shall be vegetated. 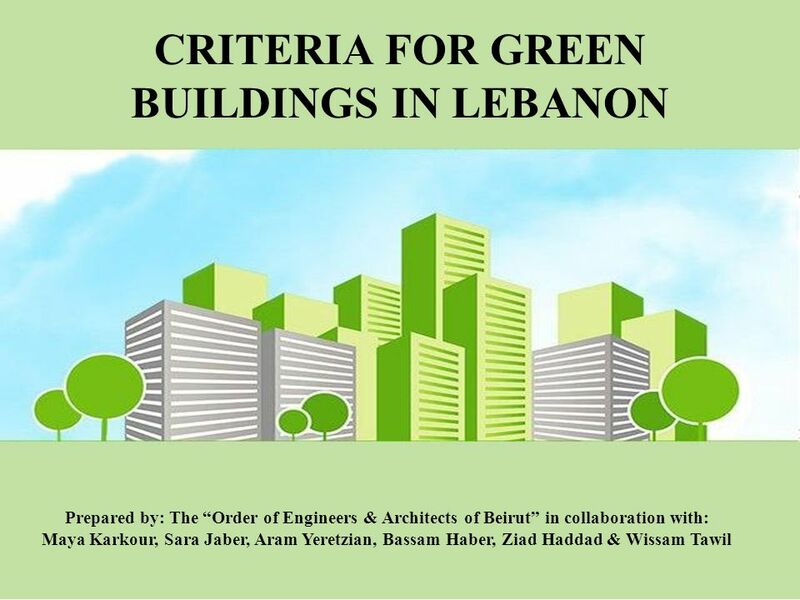 In case of no landscape area, then 10 % of site area shall be vegetated on roofs, walls or planters. - vegetated - Covered with high SRI material - Shaded by SRI material - Shaded by solar panels - Or a combination of the above Roofs shall have 50 % of the non tech area: Vegetated Covered with high SRI Shaded with high SRI Shaded by solar panels Or a combination of the above SRI: Index combining reflectivity & emissivity. 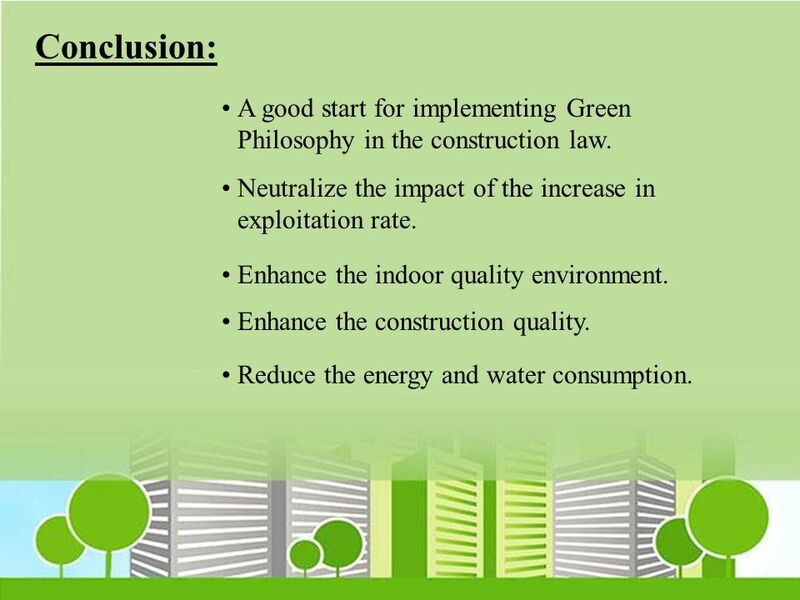 19 Conclusion: A good start for implementing Green Philosophy in the construction law. Neutralize the impact of the increase in exploitation rate. 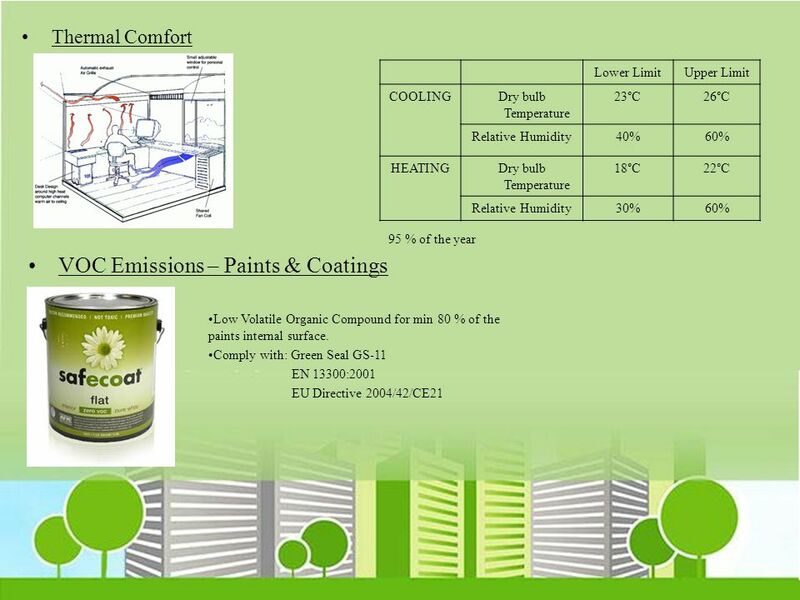 Enhance the indoor quality environment. Enhance the construction quality. 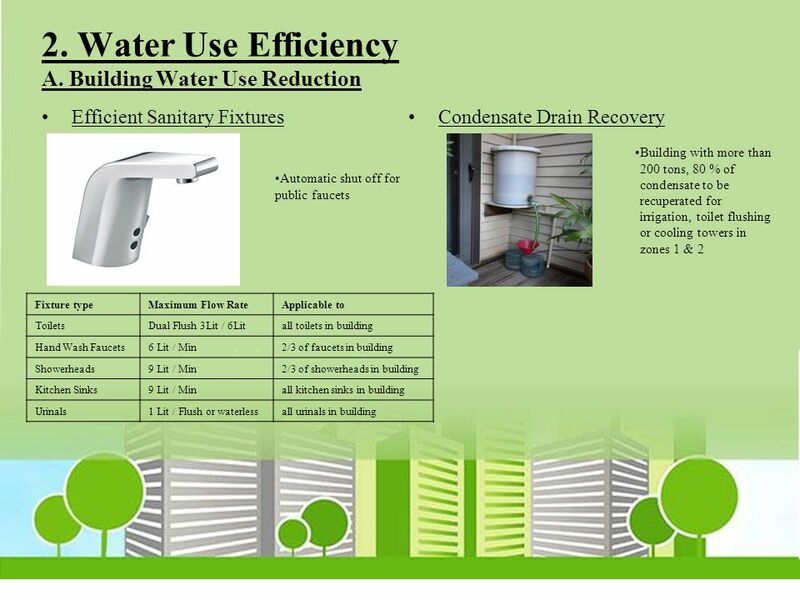 Reduce the energy and water consumption. 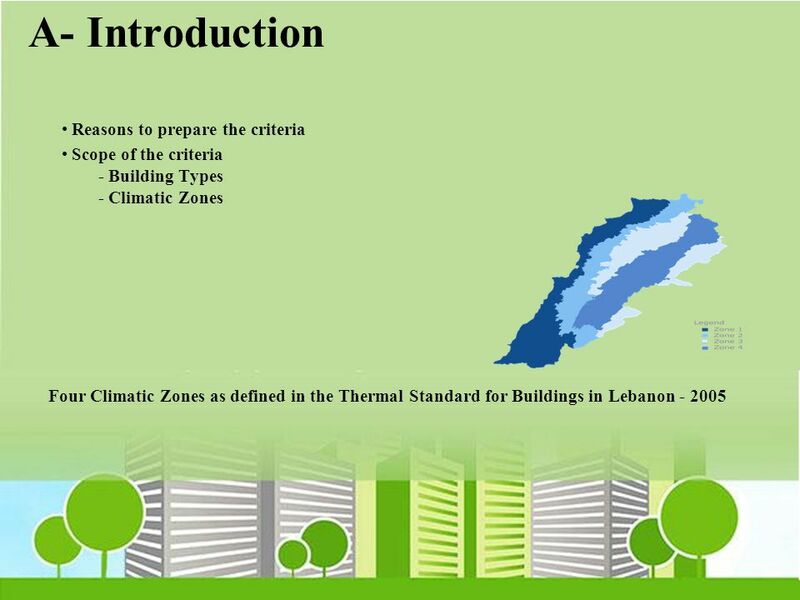 Download ppt "CRITERIA FOR GREEN BUILDINGS IN LEBANON"
Beirut Energy Forum Metropolitan Hotel September 30 – October 1, 2010 Greening of the construction law. 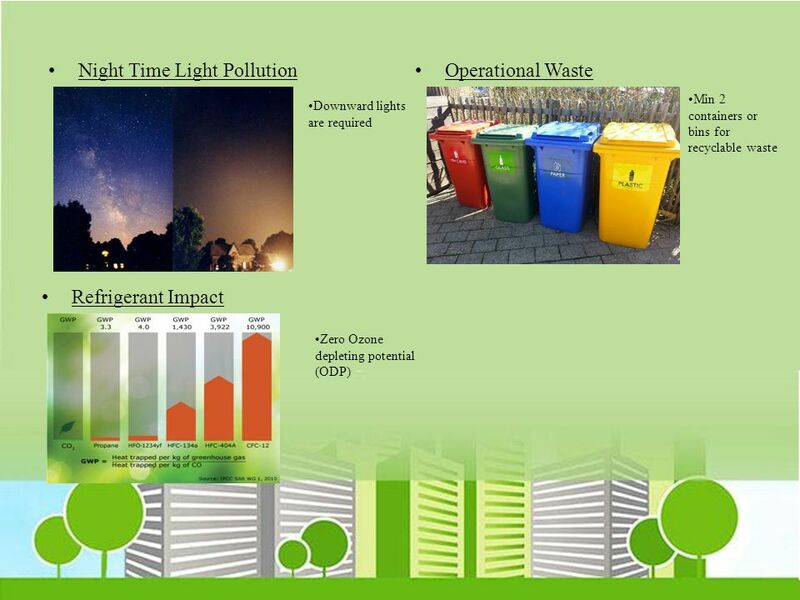 Sustainability - Long Term Value Creation May 2012. By: R.M. Chitranshi. ECBC With the background of high energy saving potential and its benefits bridging the gap between demand and supply, reducing environmental. INTD 51 human environments building systems. 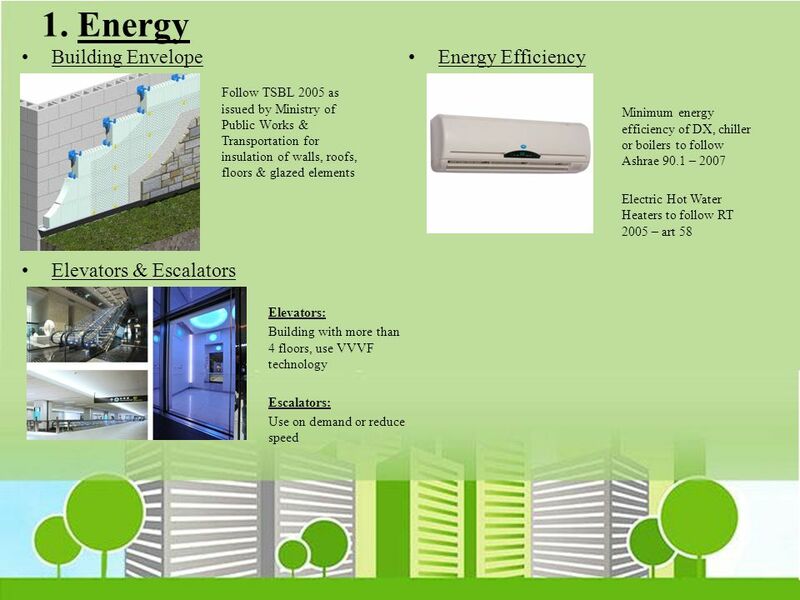 heating/ventilation/air-conditioning (HVAC) maintain a comfortable indoor climate control temperature and. Plumbing System Albert Einstein was named an honorary member of the Plumbers and Steamfitters Union after publicly stating that he would become a plumber. Energy in Focus Energy Savings with Water Based Systems By Maija Virta Specialist of Indoor Environment Technology. Presented by: Jane Briggs and Karen Mitchell October 11, 2007 The New LEED Building at Shady Grove. SUSTAINABLE METHODS AND TRENDS Sebastian Eilert, AIA, LEED AP October 9, 2007. 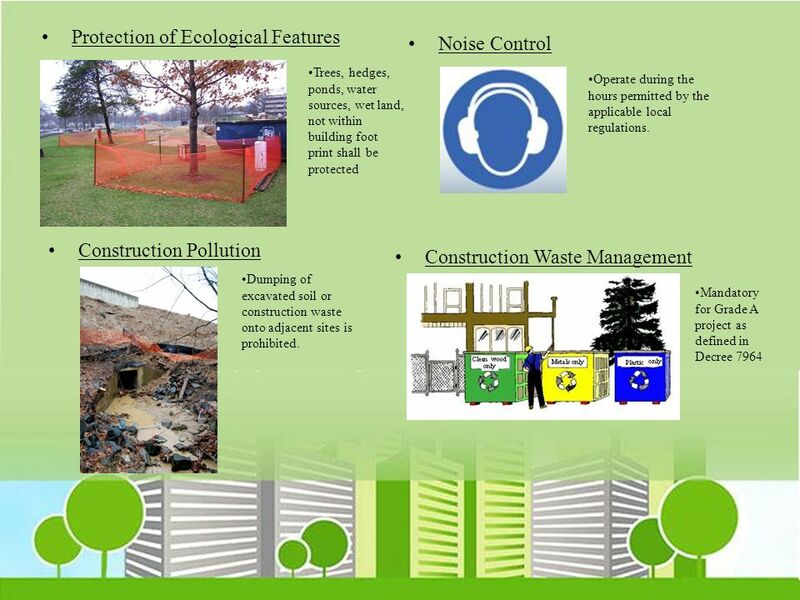 Hope VI Residents Deserve Green Housing Affordable, Healthy Home Design Choices. Engert, Scheriau, Wimmer SS 2010 Energy and sustainable development, Prof. Schleicher.